Fiji, or Viti as the locals know it, is one of those perfect tropical island destinations we have all dreamed about. Perfect days of coral reefs, swimming, snorkeling, scuba and cocktails. An ideal way to spend a week or three away from the stresses of work! Luckily for us all, there is such a place, ideally located only 25 minutes from Nadi international airport, on the Western side of Fiji. Sonaisali Island Resort is the only form of civilisation on Sonaisali Island which is itself named after the local Naisali people. Unlike many other places you can stay at, being on an island means that there are no walls surrounding the resort, only open spaces and beautiful tropical gardens. A short 3 minute ferry ride from the mainland sees you stepping onto your own tropical hideaway! Smiling Fijians, some of the friendliest people you will ever meet, greet you as you step onto the wharf. 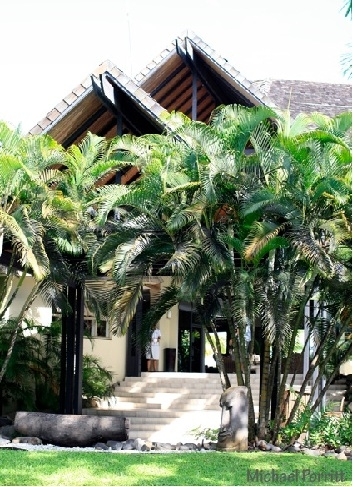 The resort reception is located through the breathtaking gardens on the ocean side of the island, where the legendary friendliness continues. Local Fijians sing the traditional welcoming song of the Naisali people while you check in with a complimentary cocktail of fresh local juices as refreshment. There are a few things I look for in a resort whenever we have the pleasure of staying in one. Firstly it is always the friendliness of the staff. You never get a second chance at making a first impression! Secondly the rooms, and thirdly the pool and bar area! Sonaisali ticks the box in all three categories. The bure's are sensational, letting you get the feel of actually living in Fiji rather than in any room that could be taken out of any of a hundred or so resorts. High roofs, wooden slat walls, ceiling fans, wooden furniture, coconuts and the all important air conditioning, give the accommodation a warm and welcoming Fijian feel. The central pool / bar / restaurant area is also perfect. With wooden decks that run from the bar and restaurant to the pools edge, it gives the whole area an open feel that reminds me of a tropical oasis. The all important pool bar is also perfect for those days where all you want to do is laze in the pool and sample the wide range of cocktails on offer. No tropical island resort would be complete without the all important list of fun things to do while you relax and Sonaisali hosts a wide range of exciting activities, some unique to Fiji! The resort boasts it's own 5 star PADI dive shop, where you can take full advantage of being in one of the five best dive sites in the world (with the worlds best soft coral dives). With 25 spectacular dive sites - including wreck and cave dives, drop offs and walls - located between 15 and 45 minutes away, there is enough variety for even the most seasoned diver. We were lucky enough to be taken out to "The Pinnacles" by Sonaisali’s divemaster, Hanfiro. There we experienced some of the most beautiful coral formations and underwater landscapes I had seen in a long time. The abundant variety of fish and corals was breathtaking, with swimthroughs, vertical walls, and drop offs. Although we didn't see any on our dive, Hanfiro mentioned that there are often a variety of reef sharks that are normally seen swimming in the currents just off The Pinnacles themselves. The Pinnacles is also renown for being a perfect night dive, for those interested in seeing the other sort of night life Fiji has to offer. Sonaisali Island Resort also hosts it's own PADI dive instructor, so full PADI certification, or just a SCUBA discovery can be conducted while on your holidays if you haven't had the opportunity to try this amazing sport. If SCUBA isn't your cup of tea, but you still want to experience the reefs, there are a variety of cruise options that will take you to the crystal waters of Fiji. 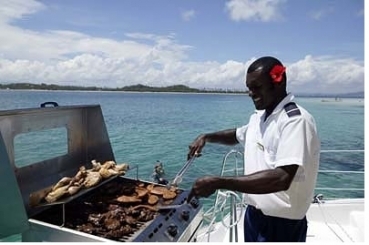 The resort has it's own 35 foot luxury catamaran, the Cagi Malua (“Soft Wind”) which is available for all day cruises to the Mamanuca Islands, including a barbecue lunch onboard. 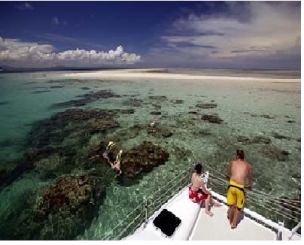 This is a perfect way to see the amazing variety and number of fish that make Fiji a marine paradise. Or sit back, relax and soak up a sunset cruise with champagne and canapés. A perfect way to end the day! Another adventure, unique to Sonaisali Island Resort, is paintball. The resort has constructed a specially designed playing field in a secluded area of the island where you can participate in 4 different types of games which vary in difficulty. An introductory "basic team game", "capture the flag", "skirmish", and "medic" can be played where you can hone your combat skills and legally shoot your friends and family! If you are after the ultimate in luxury and indulgence though, you can’t go past the resorts own "Frangipani Spa". With a range of facials, massage, scrubs, wraps, soaks, hand and feet treatments and a variety of spa packages, this is the ultimate way to unwind and de-stress! Sonaisali Island Resort also offers a variety of complimentary daily activities including hobie cats, canoe's, tennis, volleyball, windsurfing, paddle boats and cultural activities like Fijian story telling, sulu tying, palm leaf weaving, coconut tree climbing, Fijian cooking demonstrations, meke shows and local choirs. Once a week, villagers from Beqa Island perform traditional fire walking at the islands Sunset Point. These are the only Fijians who can perform this feat. 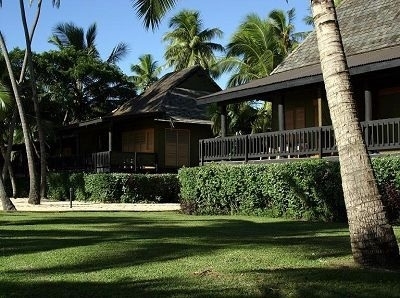 Sonaisali Island Resort boasts 123 rooms. 32 are beachfront hotel rooms and the remaining 91 are either ocean view, family or beachfront spa bure’s on the 105 acre private island. The hotel rooms have been recently refurbished and the traditional Fijian style bure’s are scheduled next on the refurbishment list, even though they are absolutely beautiful as they are. One of the most important aspects of Sonaisali Island Resort in my opinion, is their continued efforts to be environmentally responsible. Sonaisali consistently achieves ‘above the benchmark’ figures for green globe certification, which recognises the resorts commitment towards operating at the worlds highest environmental standard. This standard measures key environmental performance areas, including water usage, waste management and energy efficiency. The commitment of staff and management towards maintaining environmental and sustainable practices has resulted in the resort being awarded the prestigious Green Planet award by Kuoni Switzerland. This award has been operating since 2000 and is awarded to hotels whose operations are particularly progressive in environmental and social terms. A great example of the resorts environmental focus can be seen in their greenhouses, where they propagate all of the native plants used in their spectacular gardens. 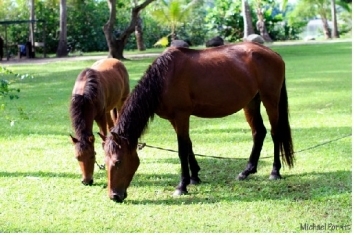 Not only that, but the resort also cultivates a large majority of it's vegetables including lettuce, tomatoes and herbs. The horticultural team is aiming to be 100% reliant on it's hydroponic plant in the near future. 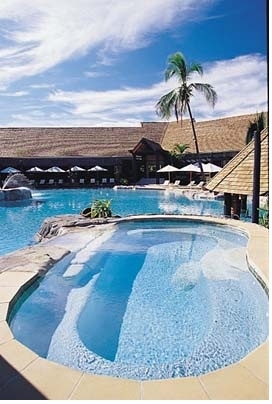 Fiji is approximately 4 hours flight from Sydney, 3 hours from Auckland and a 10 hour flight from Los Angeles. Flights leave everyday from Australia and New Zealand and 3 times per week from LA.